The advent of SD-WAN has changed the face of networking in many ways but especially in providing consumers with the ability to source their WANs from more than just a single vendor. 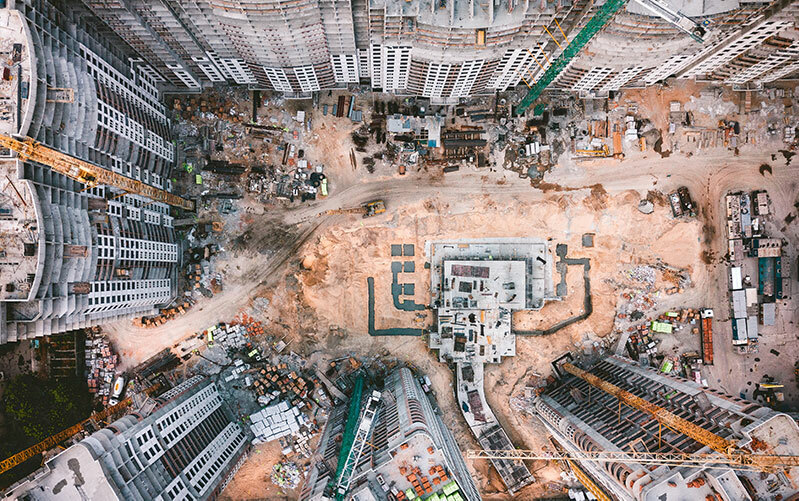 We recently explored the new SD-WAN management overlay options in our Telco vs Non-Telco delivered SD-WAN article which provides great insights when considering your SD-WAN sourcing and management strategy. Just like the overlay market, the options for how you purchase your carriage services, or underlay, is rapidly changing from an almost exclusive telco domain to a much broader playing field. The rapid growth in streaming services worldwide, such as Netflix, which are driving bandwidth demand and availability both in-country and across the globe. The end result is a constant increase in the amount and quality of internet bandwidth available but at an ever-reducing price. Who Are the Big Bandwidth Users? Utilization of bandwidth has changed substantially over time with the growing force being content providers including the likes of Google, Facebook, Microsoft and Amazon Web Services. This growth has now reached around 54% of all used bandwidth. As the traditional vendor of WAN services at both underlay and management levels, telcos are the most obvious candidates for WAN underlay services. They still offer a broad range of underlay types and service options which provides an easy one-stop solution for enterprises with a single vendor preference. However with the accelerating demand for SD-WAN, carriers are being forced to adapt their service offerings and provide greater internet options at the expense of their vast MPLS infrastructure. Telcos are under increasing pressure to match market bandwidth pricing due to the extensive options now available to their customers both in the WAN and non-WAN environments. This is typically very difficult for telcos to do due to the huge legacy investments they have in their networks either domestically or globally. Over time, this pressure on the telcos business models will only increase. ISPs are a growing supplier of bandwidth to enterprises as the migration to SD-WAN accelerates. With the performance of internet constantly being proven in the SD-WAN environment, internet is rapidly becoming a greater percentage of WAN underlay bandwidth. The rise of streaming services has forced ISPs globally to invest in their networks to cater for both the greater bandwidth demand and greater technical demands of these services. As a result, enterprises have the choice of a larger number of suppliers offering high speed, good quality internet in most parts of the world. The combined effect of these two forces is constant reduction in bandwidth costs with no end currently in sight. 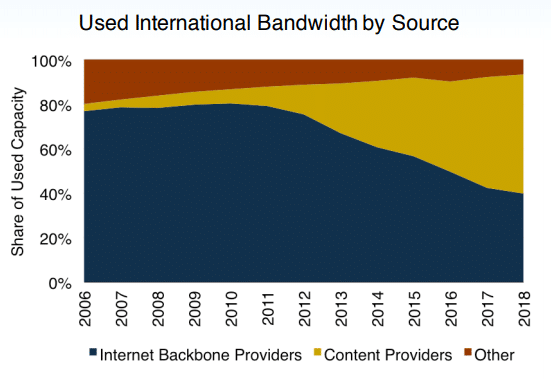 While ISPs typically only offer their services in one country or maybe a region, the demand for a multi-region or global network of internet services has steadily grown. This has spawned a new group of vendors, such as Expereo who offer managed internet networks. These vendors will source bandwidth from a multitude of ISPs globally, integrate it into a single network with cloud connectivity as required, then place a management wrap with SLAs around it. The key benefit they bring is a one-stop-shop for procurement, delivery and ongoing support of your internet network. While generally not the first vendors to spring to mind when considering non-telco underlay, cloud providers are emerging players in this space and have the potential to go on to be substantial forces. Amazon Web Services (AWS), Microsoft Azure and Google Cloud are the three biggest vendors in the public cloud space. 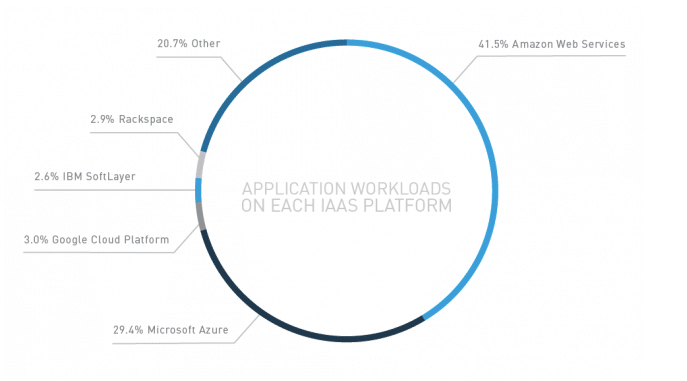 The diagram below shows their market share based on application workloads on each platform. 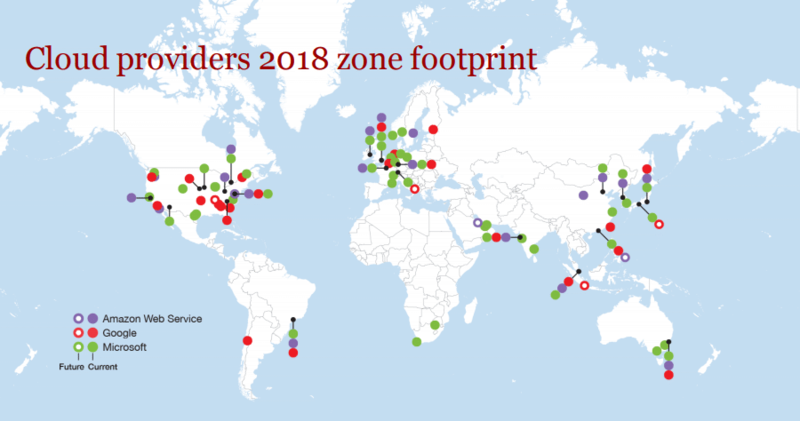 These vendors are constantly expanding their global infrastructure and foot print as the diagram below shows. 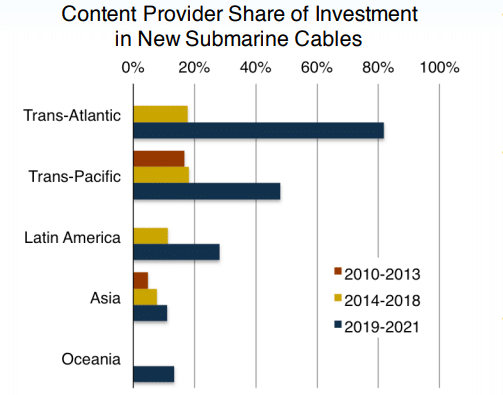 As part of this global expansion by these vendors and other major content providers (eg Facebook), not only are they focused on expanding land-based networks, they are investing in submarine cables also. The diagram below details the growing investment by content providers over the current decade. With these ever expanding global networks and a growing proportion of business applications in their cloud environments, while still early days these vendors are rapidly becoming a realistic option as a WAN backbone solution. The trending towards SD-WAN will only continue to rise driving a greater demand for internet bandwidth and a decline in traditional WAN technologies such as MPLS. With the greater demand for internet bandwidth generally and a diversity of vendors, prices will continue to trend down. As cloud providers position themselves better as WAN solution providers, a new wave of vendors will threaten traditional carriers in the global WAN and bandwidth markets. With the transition to greater internet consumption, the range of potential vendors has increased and contract terms are becoming shorter. The arrival of internet network providers and cloud providers as WAN connectivity suppliers provides options to simplify the procurement, consumption and management of that bandwidth. The opportunity for any organization going forward is to source their bandwidth on shorter term contracts (e.g., 12-24 months) and to use the more regular review period to both drive down cost and increase bandwidth to address the endless consumption growth. By following this cycle on a regular basis, your organization will have the agility to keep costs and bandwidth in step with changing business demands. Need some assistance? For a high-level overview and advice on your options, Coevolve can help. Get in touch with our solutions experts today by clicking here.